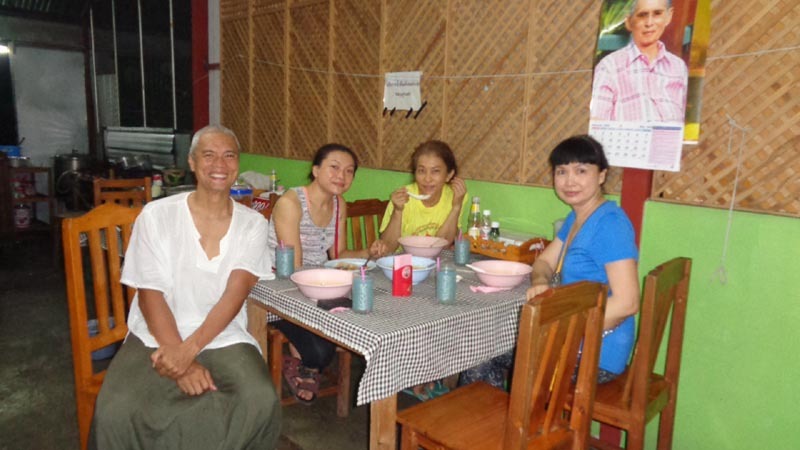 A Sivananda yoga teacher in Phan District accepted my offer to teach free yoga in her studio. 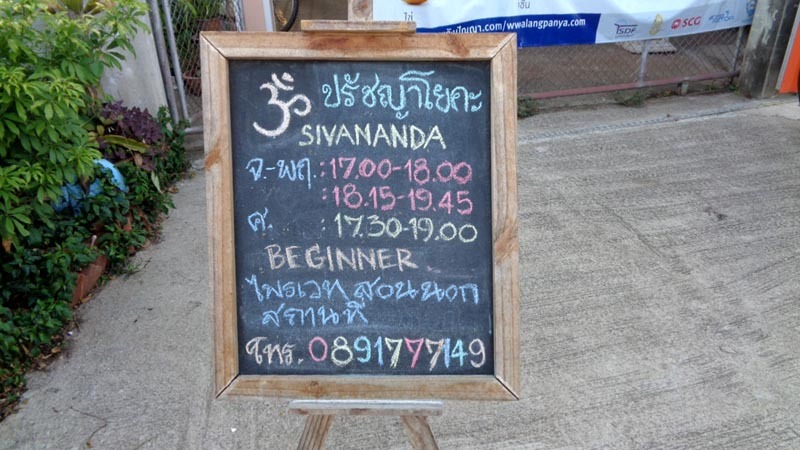 I also asked if I can attend her Sivananda class. She said yes. With that, after 5 days in Chiang Rai, I was off to Phan, 40 kms south to stay a day or two. It was difficult to get the right bus at the Chiang Rai bus station. The way I say "Phan" was different from how the locals say it. With good intentions, they pointed me out to different bus directions. All the signs were in Thai and no one spoke English. I was confused and felt helpless. The right bus was just near me and would have left without me if not for a good Samaritan who took the pains of knowing where I was heading. I really love the Thai people - time and time again, they have given me their time and hospitality. I had been using the Google Maps App lately and it's been such a tremendous help. I would put a marker on my destination and then use the "You are here" marker feature on the map. As I get closer to my destination, the "You are here" marker gets closer to my destination marker. I would know exactly when to say "stop" to the driver - saves me tuk-tuk money or saves me a long walk. At B150/night for a dorm bed and B50/day for a bicycle, I stayed at The Old Phanburi Bed and Breakfast. It's clean and the hands-on owners are friendly, helpful and pleasant. They gave me a discount on the bike rental and even took me to the songthaew station on my departure. Really nice people. 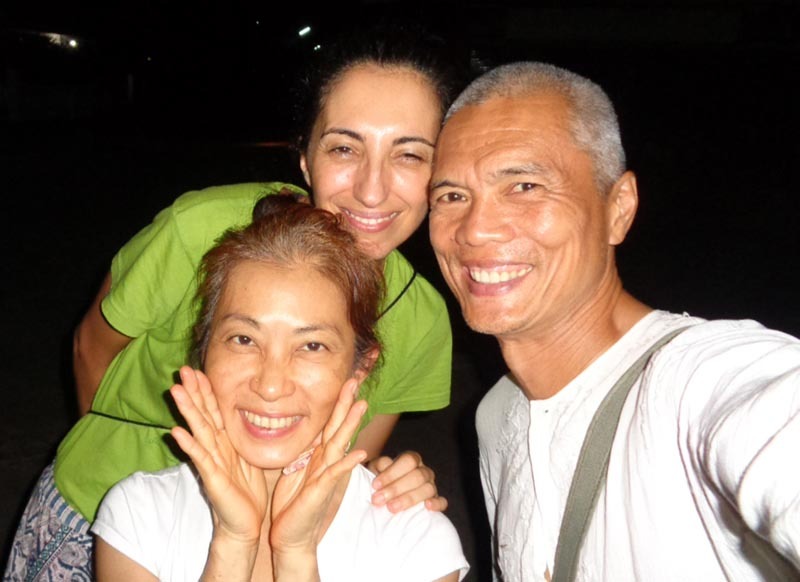 Amm Prajna Pitchaya is a Certified Yoga Instructor from the International Sivananda Vedanta who runs her own studio, at Prajna Yoga Shala, in Phan. She has been practising yoga for 3 years. 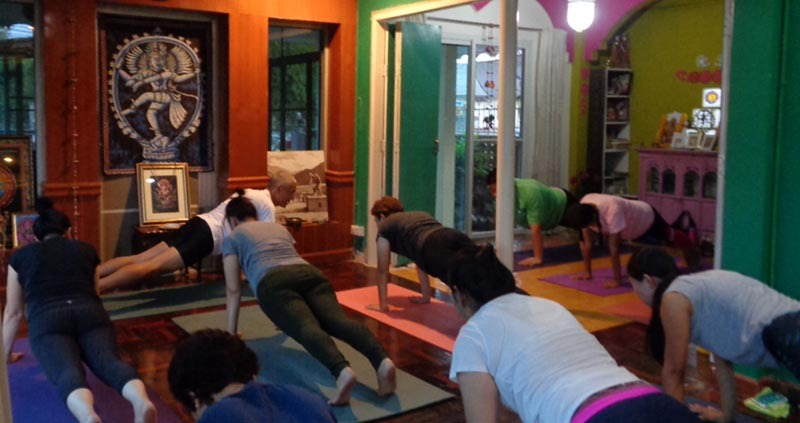 She's the only yoga studio in town and enjoys a dedicated yoga community who practice daily with her. It's a wholesome, supportive and empowered community of mostly women. 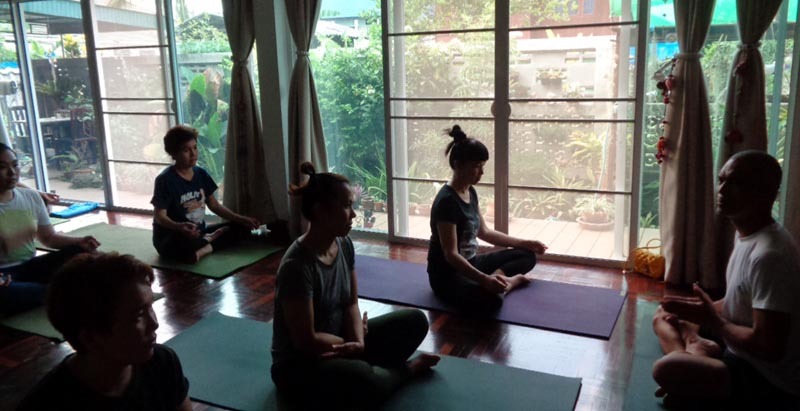 She would be my yoga hostess in Phan. I attended 2 of her Sivananda style classes. The asanas (poses) vary slightly with Ashtanga with focus on the chakras from the head going down. So it was a surprise to do a headstand early on in the sequence. I also noticed that poses are held longer. This suits me well. Even if I do Ashtanga poses alone, I usually hold them longer, allowing myself to sink deeper into the pose. I would hold it for 10 to 15 breaths until I feel that I got the full benefit of the pose. In effect, when I do my own practice, I combine many elements of Ashtanga, Sivananda and Vinyasa yoga. I taught 2 classes. One was core-focused with lots of Chaturangas transitioning into Upper Dog. Since the students are not used to this sequence, it was a challenge to them. But they were strong and gung ho. The second class I taught was more of a handstand workshop. The asanas were warm-ups to all the muscle groups we would use including core strengthening. 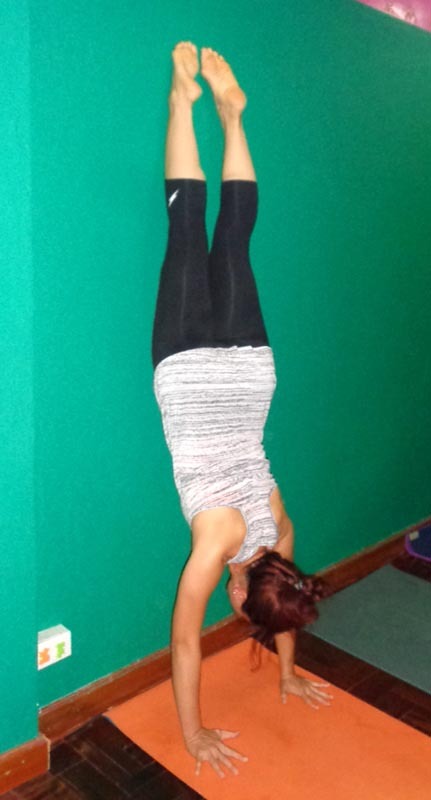 Finally, we all went to the wall for our inversions. I guess they loved it. Even after Savasana, they still went for the wall! After the class, the group took me to dinner where we shared ideas, stories and insights. This happened on two occasions. It was good bonding. It's a community I could very well gel myself into. Like all good things, it also had to come to a close. With only 14 days on my Thai visa, I had to pack up and use up my remaining days in Pai. It was sweet of them to say I could come anytime. I already miss them. Thank you Amm! Directions: from anywhere in Phan, ride a tuk-tuk and tell them to take you to the Mae San Bridge. They will not know Prajna Yoga Shala. Refer to the Google Map. You can also walk it from the main street. Phan is not a tourist destination. The few foreigners you see here are expats who chose to live here. The closest big city is Chiang Rai, one hour north. This is more complicated even though Phan is closer to Chiang Mai than Chiang Rai. There are 3 ways. Direct - you get on the bus in Phan and you get off in Chiang Mai. But this is the longest route because the bus makes a circular route south passing through Payao, Lampan, Lamphun before it reaches Chiang Mai - B165, 5 hours! (May 21, 2016) Also thanks for giving us positive energy. 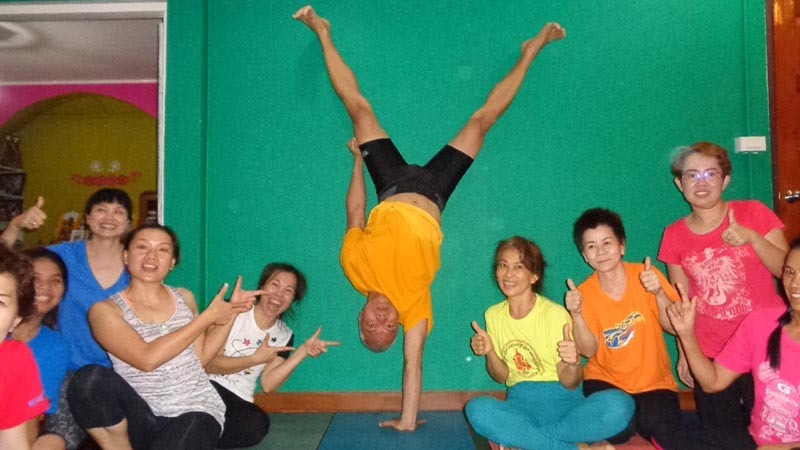 Especially the 2nd class the handstand preparation workshop. Your instructions are very clear and exciting at the same time. We enjoyed a lot.